Growing up in an Italian-American family in New Jersey, Friday meant two things: the start of the weekend and pizza. Generally, we'd pick up two pies for the five of us. Usually we'd go with two plain because we just loved the pizza so much that it didn't need anything added but, occasionally, we'd have a temporary favorite to add to the mix. I remember one such stretch where we discovered and fell in love with a BLT pie from Dominick's . Dominick's is my favorite at home, nice thin crust with a crispy edge but chewy center, simple but tasty sweet tomato sauce and high quality mozzarella. One Friday, we branched out and tried the BLT pie. Crust, mozz, bacon, lettuce, tomato, mayo. I don't know what it was about that pizza but it was a winner for everyone around the table. 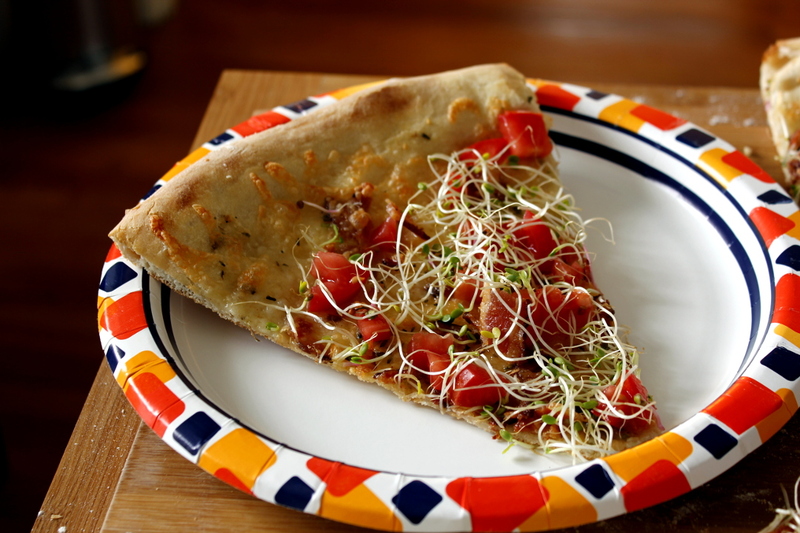 The pliable but crusty pizza crust was the perfect toasted yet pillowy vehicle for the smoky, salty goodness of the bacon. The lettuce, tomato, and mayo cut through the tang of the bacon and balanced it nicely. Here, I tried to replicate that with some things I had around the house, including left over sprouts from some spaghetti squash pad thai.